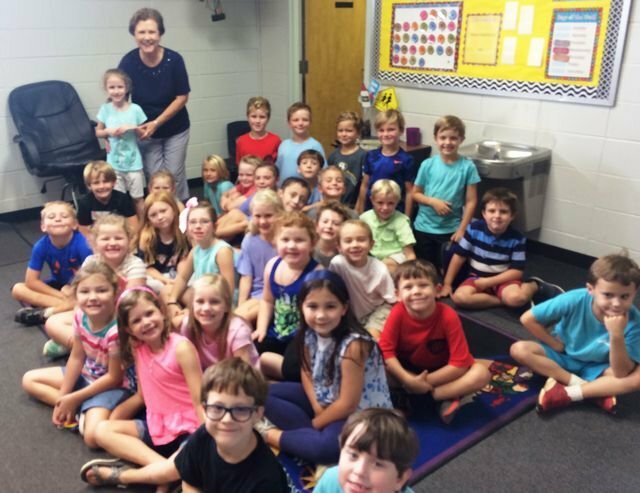 Mrs. Heath is pictured with her proud first grade granddaughter, Kayden, along with the other children who thoroughly enjoyed her animated storytelling skills. Mrs. Kay Heath, a well known local children's book author and retired educator, recently visited Southland Academy. She is fondly known as Mama KK to many Southland students and especially to her grandchildren, Kayden and Maddox Miller. Mama KK entertained the Southland first grade classes with a delightful story, The Crooked Mouth Family, Mrs. Heath's reputation precedes her in schools and communities alike, as she holds a wonderful following of children and adults. Her animation as well as her gift of storytelling brings her stories to life. Southland Academy is proud to have her books in the classrooms and the library. Mrs. Heath's chapter books include Ida Claire, It's Summertime!, Ida Claire, That's Funny!, and Ida Claire, That's A Mystery! Her rhyming picture book, Three Little Frogs in a Boomerang Journey has a sequel, Three Little Frogs Go to the Beach. Books are NOT My Favorite Things is also one of her many entertaining books.